Jaw couplings are an incredibly robust and popular solution for transmitting torque between two shafts. 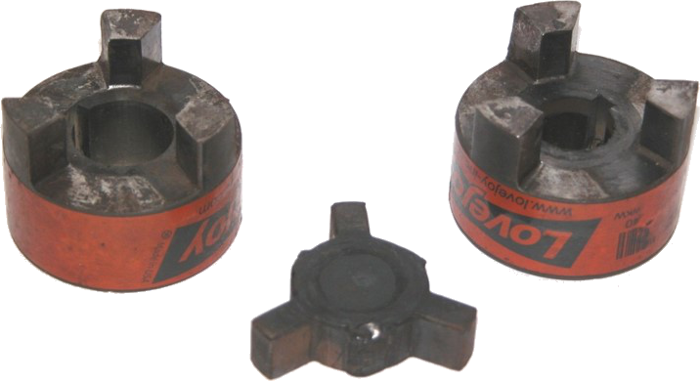 With tens of millions of applications currently running around the world using jaw couplings, this coupling type is one of the most trusted power transmission devices on the planet... however, like almost anything else, they can and do fail. When they do, whatever the application is and whatever corner of the world you may be in, it is important to be able to quickly understand why the coupling failed... as well as what needs to be done to ensure your application is safely up and running as soon as possible. This post will explore the most common jaw coupling "signature" failure modes, and hopefully help you get started in identifying and correcting any jaw coupling failures you may come across. 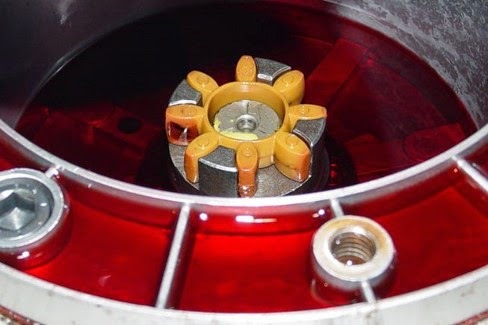 All failures discussed in this post will fall into one of five categories: normal wear, torque overload failure, misalignment failure, environmental failure, or vibration failure. Should you care to learn more about jaw coupling basics before carrying on with failure modes, please check out: Jaw Coupling Overview - Features & Benefits, Design Basics, and Element Options. 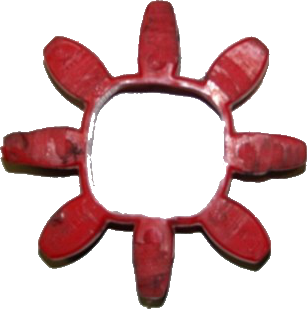 The image at the top of the page (and at right) is actually an example of normal even elastomeric jaw coupling spider wear for a coupling that is operated in one direction only. The wear is even and linear, indicating that misalignment does not appear to be an issue with this specific application. And how fast does it take for the coupling spider to be compressed to 75%? Unfortunately, this cannot be calculated as it is entirely application specific. The environment, peak torques, selected service factor, misalignment, system vibrations, starts/stops... will all play a role in determining how long it takes for the spider to compress to 75%. 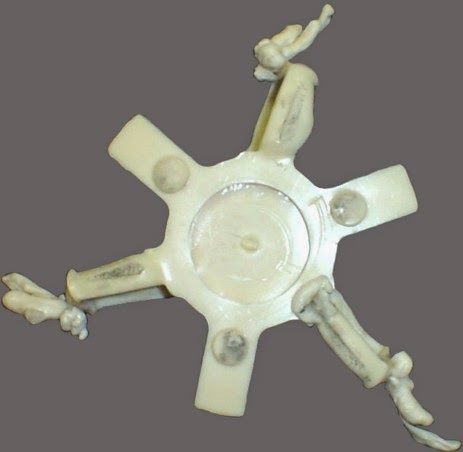 Bonus Suggestion: If you are running an application in only one direction, and discover wear on your spider similar to the one pictured above (3 legs compressed 25% or more)... if you don't have a replacement spider readily available, you can rotate the spider one leg rotation (moving the 3 uncompressed legs into the position the 3 compressed legs were), and continue running the application until your replacement spider arrives. Overload or over-torque occurs when the coupling is subjected to peak torque load(s) in excess of the calculated coupling sizing torque (which, again, if you don't understand... please click the link above). This can happen because the coupling was undersized (usually the case), or because something terribly wrong and unexpected happened in the system. In the case of the coupling being undersized, it is important to not just replace the failed coupling, but to go through the selection process again... selecting a coupling that meets the necessary requirements of the application. Jaw couplings are fail-safe by design (meaning they can continue to run after a failure), and this is because, even after the elastomeric spider legs are sheared away... the metallic hubs will interlock and continue to transmit torque. This is not a good long term condition for a system, but can be a useful feature during short term cases of emergency. 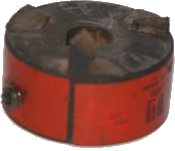 The metallic jaw hubs will rub and wear away on each other (without lubrication), so quickly identifying the root cause of the failure (which may be an undersized coupling) and replacing the element and/or coupling is important. 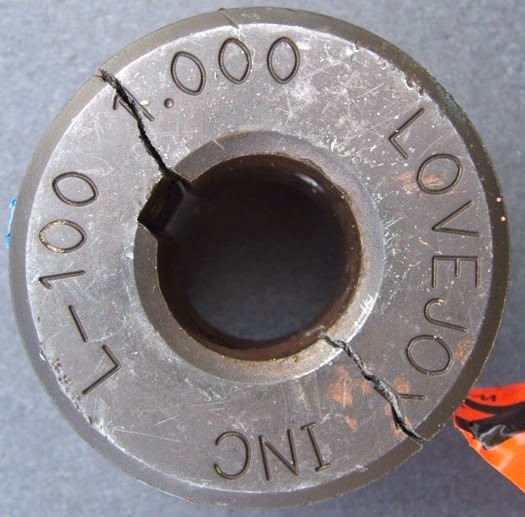 When a jaw coupling hub fails catastrophically, it will typically fail either by shearing at the jaw legs (pictured at right), or by crack open between the inside bore and outside diameter of the hub (generally along the keyway, as pictured below). Coupling hubs generally cracking along the keyway because there is less metal between the keyway and the outside diameter of the hub than at any other spot of the inner bore. The keyway is the weak link, and, specifically, the corners of the keyway are the weakest link inside the keyway. This failure mode is common to a large number of coupling types, and generally referred to as a "keyway burst". Second only to transmitting torque, flexible couplings are designed to accommodate for system misalignment. 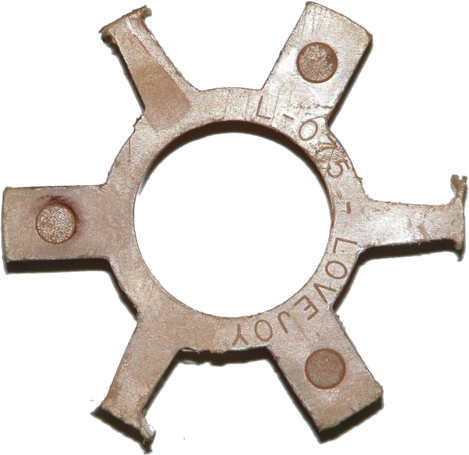 Couplings are designed and rated to handle a certain amount of angular, parallel, and axial misalignment... but users do not always stay within these published ratings. The tell tail sign that misalignment is causing premature jaw coupling is that the jaw coupling spider is wearing unevenly... either at an angle or not across the full face of the spider legs. 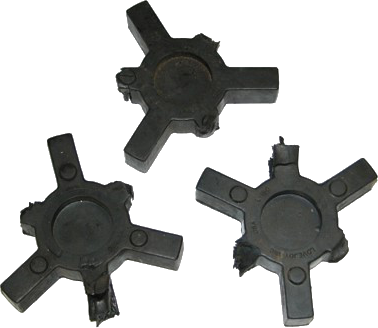 Spider "dust" may also be present in coupling or coupling guard. The spider legs under compression (shown at right) look like pizza wedges. This is a classic misalignment issue, so replacing the coupling alone will not address the underlying misalignment that is present in the application. The two shafts connected to the coupling must be either realigned (preferable), or a different coupling that can handle the misalignment needs to be selected. The two primary environmental issues that cause jaw coupling failure are temperature related (above or below the rated temperature of the elastomer), or chemical related (where the elastomer is not compatible with a chemical present in and around the coupling). On temperature... pushing an elastomer outside its rated temperature range, can and will lead to premature spider failure. 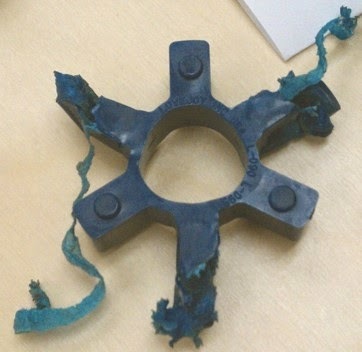 While these failures can look similar to an over-torque, if caught early enough, they can also be identified by cracks in the elastomeric spider's legs. (Hint: If no suitable spider can be found to handle the temperature of the system, consider looking into all metallic couplings... which are broadly summarized in this article: Flexible Coupling Basics - A Quick Primer). 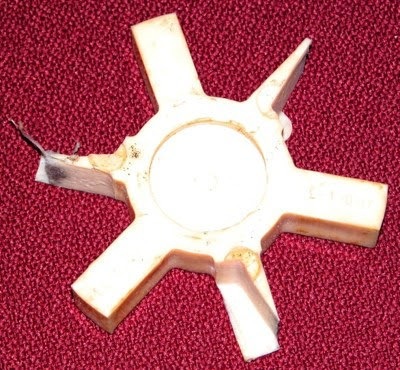 On chemical failures... if an elastomeric spider is in contact with chemicals that it is not compatible with, the spider will generally rapidly deteriorate and fail, sometimes breaking off in pieces. Coupling manufacturers will generally include compatibility guidelines in their catalogs for each elastomer material relative to traditional chemicals that a coupling may come in contact with. If you know you coupling is going to be in regular contact with a fluid, it is important that you check the manufacturers catalog to ensure compatibility and/or call the manufacturer to confirm if their catalog does not include such information. Ensuring temperature and chemical compatibility are two of the top ten factors for selecting a coupling, and should never be minimized or ignore. Vibration failures are one of the easiest to identify, but can be a bit challenging to overcome. As seen in the photos at right, in this failure mode, the spider legs heat up and melt from the inside out... extruding or "oozing out" elastomeric material once the outside of the elastomer is finally compromised. 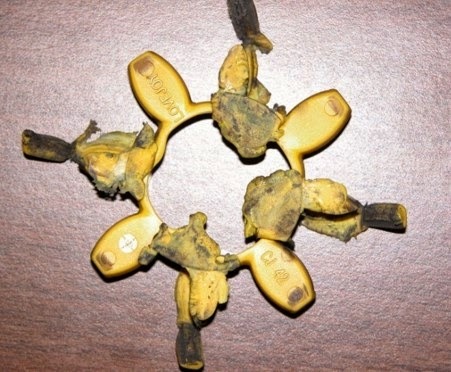 What causes this failure is a heat buildup in the spider caused by the spiders attempt to absorb damaging high natural frequencies in a system, generally caused by a reciprocating engine (diesel, gas, natural gas, liquid propane), pump, or compressor. These system natural frequencies can wreak havoc on a system (and coupling spiders), and there is actually an entire class of couplings (known as torsional couplings) designed specifically to tune a system above or below the system's natural frequency. Torsional couplings are generally much more expensive than jaw couplings. Because it is possible that a jaw coupling can (by the use of its elastomeric element) play the role of a torsional coupling (tuning the system above or below its natural frequency)... many users will try to insert a jaw coupling in the place of a true torsional coupling. 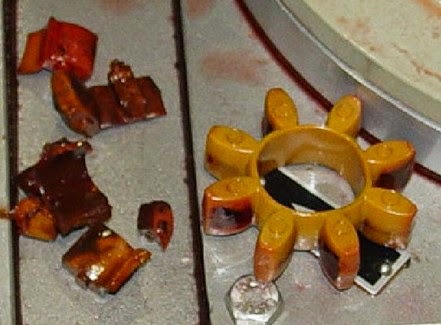 Unfortunately, if/when the jaw coupling is not able to effectively tune the system above or below its natural frequency, the elastomeric element will overheat (failing to dissipate all the heat being created as it attempts to absorbing/dampening the natural frequency vibrations)... leading to the elastomeric spider oozing. 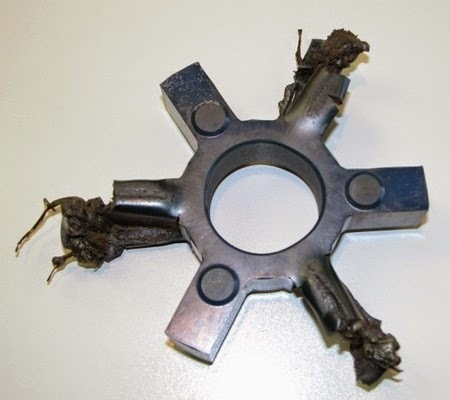 When this type of torsional failure is seen the "right response" is to contact your coupling manufacturer and request a torsional analysis for your application. The manufacturer will ask you for a number of pieces of information on your system, run some calculations, and offer you a specific torsional coupling designed specifically to tune your system out of harm's way. This solution will almost certainly cost significantly more than the jaw coupling it replaced. Ultimately, using a jaw coupling as a "poor man's torsional coupling" is an inexact science that could prove to be a cost savings if you are patient and can afford the time. Jaw coupling really are not ideally suited to serve this function, but they can work. Oozing indicates "it not working", so you need to try something different. Just replacing the spider with a like spider will not fix a torsional vibration problem. 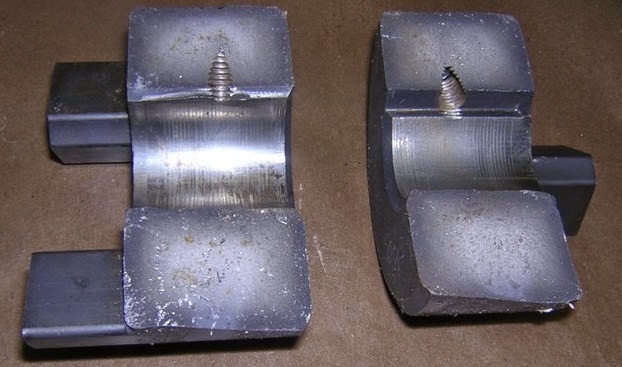 If this article did not help you better understand a jaw coupling failure and you still have questions, please give us a call or send us an email (with photos) so we can help you trouble shoot further. Alternatively, if this article was helpful for... we'd love to know that as well, so please leave us a note at the bottom of the page. For a deeper dive into jaw couplings, we recommend reading: Jaw Coupling Overview - Features & Benefits, Design Basics, and Element Options. Thanks for the props James, and best regards to you and the rest of your jbj Techniques team (a very knowledgeable Lovejoy distributor) across the pond in the UK. Why would love joy on a log splitter get VERY hit. Any help ?? James, assuming the heat is coming from the coupling (and not an external source)... shaft misalignment would be the culprit. When subject to misalignment, the elastomeric flexing "spider" is designed to accommodate it (to its catalog ratings), but, in doing so, absorbs energy which is then transferred into heat. 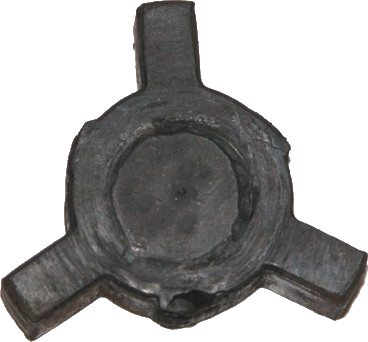 By minimizing shaft misalignment, you will minimize the amount of heat generated in the coupling... allow your system to run more efficiently... and likely get more life out of your elastomeric flexing "spider" element. This site is great! This article is very helpful. Thank You. This article mentions that a future post will cover shaft alignment in depth. Did that happen? Have you ever obtained vibration data to support determining life of a spider when there is some amount of misalignment, i.e. "if vertical ips p/k is above 0.1 ips, your life is estimated at....?". Mignt not be possible but there might be enough data to try. On the flip side, you can always take more data than you have answers for! haha. Thanks again. Hi CJames K, and thanks for the feedback! Given your level of understanding on the topic... we have not taken what you would consider a deep dive into shaft alignment... though we have hit on the topic in 3 or 4 lighter posts like the following one comparing dial and laser alignment (http://www.couplinganswers.com/2014/12/shaft-laser-alignment-3-benefits-over.html). Regarding testing, we actually do quite a bit of testing in our test lab to simulate all types of environments... but spider life (or any coupling life) is notoriously difficult to predict because (as I'm sure you know) so many environmental factors (which generally are not static) come into play. If you are a reliability guy... we certainly advocate laser or dial indicator alignment (http://www.couplinganswers.com/2014/10/top-reason-for-coupling-failure.html), and if you are an OEM or end user and would like further follow up with one of our application engineers, please don't hesitate to holler (http://www.lovejoy-inc.com/support/).